Short vacays are life support to us busy bodies, but finding good stays in our fave spots can be a tricky deal. So we did some scouting and found a these Airbnb stays that make for postcard perfect short vacays. Our go-to place Shantiniketan is a home away from home and this place is rarely ever without visitors or students. Sure, budget hotels and dorms are available in every few meters of the town, but if you are looking for a quaint place all to yourself then you’ve gotta stay at this Airbnb villa in Prantik named Notun Alo. With two bedrooms and a living room and an open kitchen, the villa overlooks a well-kept flower garden with loads of birds. There’s also a caretaker to assist you, but for the most part you’ll get to enjoy your p & q time. The entire villa is up for rent and can accommodate no more than 4 guests. Get more deets here. Price: INR 2,536 per night. Next time you are in Puri, ditch all those clone-like hotels on the beach and stay at this kitschy art-loaded homestay. At a walkable distance from the beach, you get to enjoy local culture and warm hospitality. With quirky motifs and art adorning the entire place, this one is sure to lift up your spirits and keep your aesthetic spirit well fed. They also have free WiFi, a washing machine; and car and scooter rentals close at hand. Check it out here and here. Price: INR 1,268 for a room per night. This studio in Birdsong Home is just 10 minutes away from the town centre of Mirik. An apartment sitting atop a hill and surrounded entirely by mountains and orange orchards, the studio at Birdsong Home are stuffs that make dreams come true. With wooden interiors, long extended gazebo porch and floor-to- ceiling windows that open up to endless nature, this apartment comes with one bedroom, a kitchen, open wifi and washer. Get more detail on this place here. Price: INR 3,471 per night. When the city has wiped you out of all sustenance, then what can be a better place to head to than our forever favourite, Darj. But this time instead of staying in the touristy part of the town, stay in 8 Mile in a mud cottage within a forest garden and connect back to nature. A cottage surrounded by brooding trees, chirping birds and gurgling rivers, the completely organic and plastic-free zone of Earth Dwelling has all the modern amenities of WiFi, kitchen and bath essentials. Rent this place to bask in nature’s solitude or to get back to basics of community living with the help of the locals. Check it out here and here. Price: INR 2,470 per night. This 18-acre forest farm with a private cottage is your ultimate getaway spot if you are somewhere near Gangtok, Sikkim. 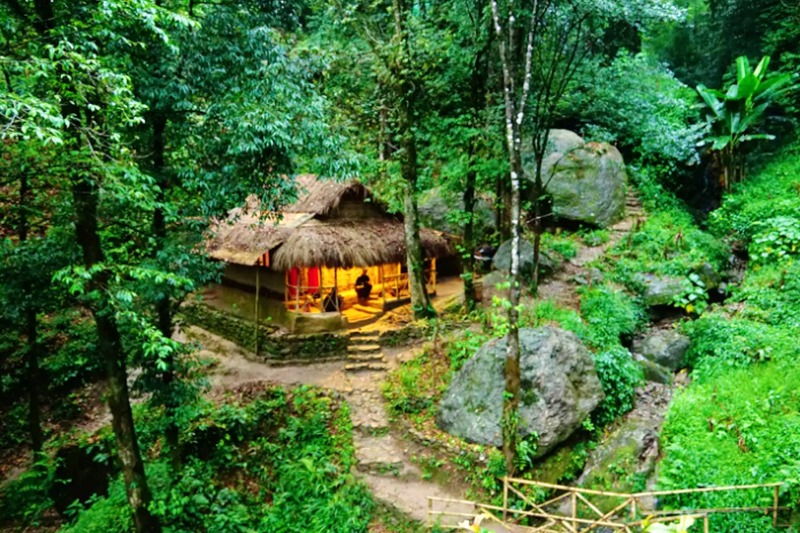 A tranquil non-touristy spot tucked within Parbing Ranka, the double-occupancy wooden cottage is surrounded by organic farms, waterfalls and serene mountains. With WiFi and other modern needs taken care of, go for a nature walk and birdwatching trips or just relax on a hammock and watch the clouds float by. Rent this cottage if you are ready for a hike because getting here involves a 10-minute downhill walk. For more info, check here or here. Price: INR 3,805 for two per night.